iPhone XS and iPhone XS Max represent incremental upgrades and look similar to the previous iPhone X. iPhone XS Max, with the largest display ever for iPhones, would appeal to fans of larger smartphones. Otherwise, iPhone XR, which is cheaper than iPhone XS by S$420-730, offers the best value for money. We do not expect telcos to suffer from hefty handset subsidies in 4Q18 due to the launch of iPhone XS, XS Max and XR. BUY M1 (Target: S$1.88) and StarHub (Target: S$1.92). Apple has released three new iPhone models. The iPhone XS with a 5.8-inch display and iPhone XS Max with a 6.5-inch display has been available since 21 Sep 18. The iPhone XR with a 6.1-inch display will be available on 26 Oct 18. Like its predecessor iPhone X, the iPhone XS and XS Max come in a surgical-grade stainless steel body covered on the front and back with scratch- resistant glass. Consumers can choose from three finishings, namely gold, space grey and silver. It has IP68 water resistance to withstand immersion in 2 meters of water for 30 mins, compared with 1 meter of water for iPhone X.
which is 15% faster and 50% more power efficient than the previous A11 processor (10nm). It has an embedded 8-core neural engine for machine learning. It can perform 5t operations per second, compared with the previous 600b. Augmented Reality (AR) and artificial intelligence (AI) apps will run more smoothly. Face ID is also processed more speedily. Choose iPhone XS Max if size does matter. iPhone XS is of the same size and retains the same 5.8-inch Super Retina display of iPhone X. iPhone XS Max is 13.9mm taller and 6.5mm wider than iPhone XS. Its 6.5-inch Super Retina display is the largest ever for an iPhone. It displays vivid colours and great contrast, ideal for watching High Dynamic Range (HDR) movies. The audio from front-facing and bottom speakers has wider stereo effect. The iPhone XS’ and XS Max’s dual camera system provides improved image fidelity and better low-light sensitivity. It has dual 12-megapixel rear camera with portrait mode and depth control. It has a 7-megapixel TrueDepth front camera. iPhone XS and XS Max could adjust the depth of portrait photos after you have taken them. It records 4K video at up to 60 frames per second. iPhone XR to be available in October. iPhone XR comes in an all-glass and aluminium body with a 6.1-inch Liquid Retina display. It has six finishings, namely black, white, blue, coral, yellow and red. It has a 12-megapixel single-lens wide-angle rear camera. It has IP67 water resistance to withstand immersion in 1 meter of water for 30 minutes. iPhone XR is better value for money. The iPhone XS and XS Max look similar to iPhone X and it is difficult to distinguish between the minor upgrades. iPhone XS Max would appeal to fans of larger smartphones and is ideal for watching movies, playing games, writing reports and emails and editing photos. Otherwise, it is preferable to wait for iPhone XR, which is better value for money and cheaper than iPhone XS by S$420-730. Neutral impact on the telco sector. High prices could be a barrier. Consumers would find the iPhone XS and XS Max expensive as Apple has introduced new 512GB variants, which are sold at S$2,199 and S$2,349 at Apple shops. The retail pricing for iPhone XS is actually similar to iPhone X for the 64GB and 256GB variants. The continued steep pricing could accelerate the shift towards SIM-only mobile service plans. No disruption from TPG. TPG is a budget and no-frills player and will likely focus on SIM-only mobile service plans. It is unlikely to compete with the incumbent telcos on offering higher handset subsidies. No negative impact from higher handset subsidies in 4Q18. Under SFRS (I) 15, revenue recognised for the sale of handsets are based on market prices observed in the retail market, such as Apple Store, rather than the subsidised prices of handsets. Accounting wise, we should not see a spike in handset subsidies causing a trough in EBITDA margin during 4Q18. We had upgraded the Singapore telecommunications sector from MARKET WEIGHT to OVERWEIGHT on 7 Sep 18: See report Telecommunications – Singapore: Second Time Lucky. Delay brings reprieve. Our channel checks suggest that TPG would launch trial for its 4G mobile network by 4Q18. We expect mobile services on a commercial basis to commence in 2Q19. This represents a delay of 4-6 months compared to our original expectations. The delay encountered by TPG Singapore affords incumbents more time to further saturate the market. To recap, TPG secured 20MHz of 900MHz spectrum and 40MHz of 2300MHz spectrum for provision of 4G services at S$105m. The spectrum rights commence on 1 Apr 17 and last for 16 years. Strong defensive qualities. Telcos recorded positive net additions and post-paid mobile subscribers increased on a yoy basis during the Global Financial Crisis. Our previous study on share price performance indicates that telcos in Singapore have a 73% chance of outperforming the MSCI Singapore Index during recessions. Telcos provide a shelter against the risk of contagion spreading across emerging markets. Maintain BUY. Singtel provides a defensive shelter due to its geographical diversification. Mobile business in Singapore accounts for only 7% of group revenue if we include its proportionate share of its associates’ revenue. We have lowered our target price to S$3.94 (COE: 6.25% and terminal growth: 1.5%) after factoring in recent depreciation of Indonesian rupiah (3Q18: -3.7%) and Indian rupee (3Q18: -6.1%) against the Singapore dollar. New CEO injects new vigour. Execution has improved since Peter Kaliaropoulos took over as CEO with effect from 9 Jul 18. Within two months of his appointment, StarHub has scaled up in cyber security with the merger of Accel Systems & Technologies with Temasek’s Quann World to form Ensign InfoSecurity. Maintain BUY. Our target price of S$1.92 is based on DCF (COE: 9.0% and terminal growth: 1.0%). Upgrade to BUY. Interest from potential acquirer would inject upward momentum for the stock. We have lowered beta from previous 1.1x to a more normalised 0.95x. Our target price of S$1.88 is based on DCF (COE: 7.5% (previous: 8.25%), terminal growth: 1.0%). 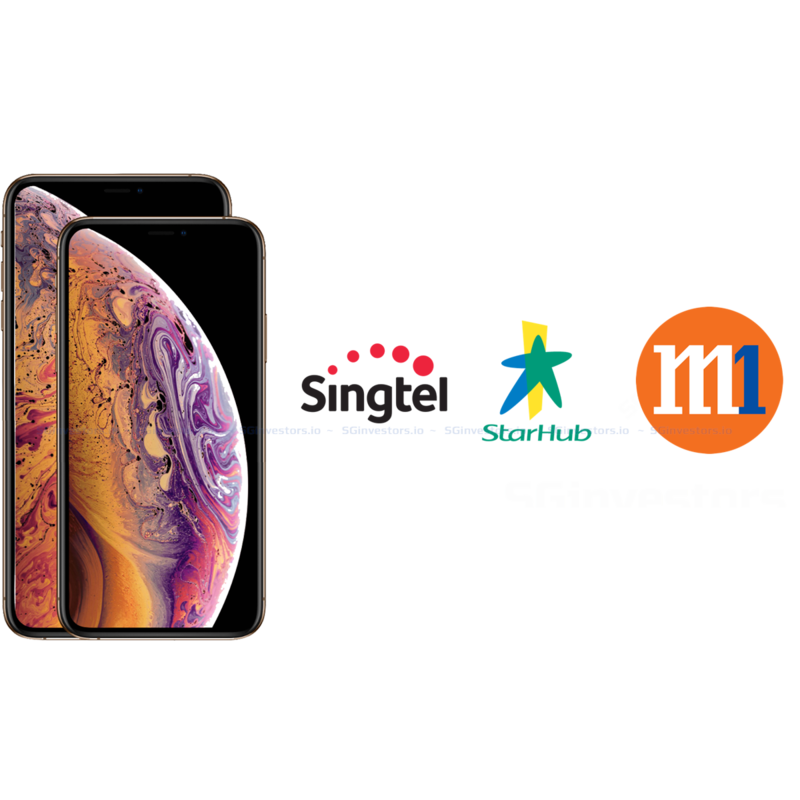 Check out the M1 / SingTel / StarHub's iPhone XS price plans comparison in the PDF report attached.